Our face is the most important part of our body, because it is the main characteristic of our look. So it is easy to understand that we would like it to have a nice contour, for giving us the expressivity we need. Unfortunately, time is the biggest enemy of our face, the skin slowly losing its elasticity and firmness, ruining the contours of our face. Also, there are several conditions that will lead to the development of an under neck jowl, such as fast weight loss or hereditary issues. The jowl will unbalance your face traits, making you look older than you really are, so it is an undesired condition. Luckily, there is a way to get this issue solved, fast, easy and without any discomfort. The solution is called PrecisionTx, a laser treatment that will minimize the invasion done on your body, while still delivering spectacular results. The purpose is to stimulate your skin to produce more collagen, a natural substance created by skin itself, which makes it look young, plump and elastic. As time passes, our skin stops producing the needed amount of collagen to maintain a firm skin, which will lead to the unaesthetic sagging. With the help of PrecisionTx, subtle laser beams will be sent beyond your skin’s surface, right to the level where collagen is produced. The entire treatment will last about one hour, allowing you to walk home right after it, without any unwanted side-effects. To make the treatment most efficient, extremely small incisions are made in the points where the laser will enter your skin. You shouldn’t worry about feeling any discomfort, because local anesthesia will be performed. After the tiny incisions are made, small cannula are introduced, which contain laser fibers. These cannulas will allow the laser energy to be directed exactly where it is needed. Throughout the entire treatment, the laser will be thermally controlled, so you won’t experience any unwanted discomforts. The energy of the laser is incredibly efficient when it comes to stimulating collagen in the skin, the results being visible almost immediately. 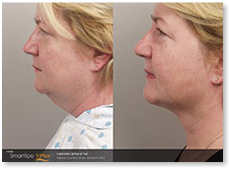 The benefits of such a procedure are amazing, because you will walk in your doctor’s office with a under neck jowl, and you will walk out without one. Your face will have a more structured appearance, having the contours that will make it look younger. Also, the neck and under the chin skin will be firmer, more elastic and rejuvenated. So, what more exactly can be felt during the PrecisionTx procedure? Again, everything is done under local anesthesia, so there will be no pain involved or major discomforts. What you will feel while the treatment is unrolling is a slight pressure in the treated areas. Also, after the anesthesia passes, soreness is another natural occurrence, as your organism is healing the treated area. But, this soreness will fade quickly, and you will be doing all the things you normally do without a problem in a very short while. Everything will be done in the doctor’s office and won’t take more than one hour. Still, the results are long-lasting, the PrecisionTx being a treatment that is done only once, for exceptional results with minimum invasion.